For some years I have been studying climate change at the local level because I believe that the discourse of global climate change is exhausted and is unhelpful to explain what is happening locally. We have made software to study the climate because it requires to work with millions of data and this work is time-consuming and time is money. We use the Moclic software to study climate change in the state of Yucatan. 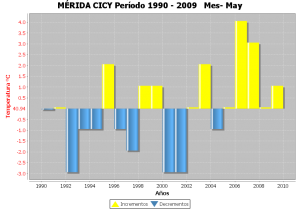 Now with the new version of software called Click-MD (Climate Change with Monthly Data) (http://www.actswithscience.com/skiu-en-los-medios/) we have studied climate change in Yucatan, Michoacan, Baja California and several other states in Mexico. Recently we found online an image of the city of Merida, capital of Yucatan state in which it looks with insignificant vegetation cover, so some people say that the loss of plant cover is leading the warming of the city, which sounds logical. But others argue that nothing happens, that is normal reach 107.7 degrees Fahrenheit in April. My position is that the situation is more complicated than that. The causes of climate change globally is well known, scientists say that greenhouse gases are causing the temperature increase and etc. etc … .., speech that you already know. The loss of trees also provides more heat because I have measured 46-50 degrees cooler under the shade of a tree between 13 and 15 h on a sunny day on April. Furthermore, the increased use of air cooling equipment increases the temperature in the city, these machines cool the air inside cars and homes, but heat up outside. I show to you the data from the weather station “Scientific Research Center of Yucatán” in which experts are generating data and, therefore, we will not doubt them. 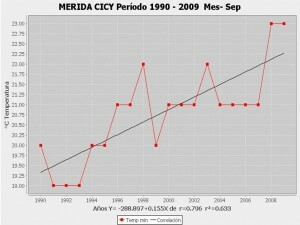 The graph shows a steady and linear increase of temperature with r2 = 0.633 for the measurement period from 1990 to 2009. This is the hottest month, but I selected it because the value of r2 is of a temperature rise trend. In the graph of May, the monthly maximum temperature reached an average of 105.8 degrees with a maximum value of 113.1 degrees. 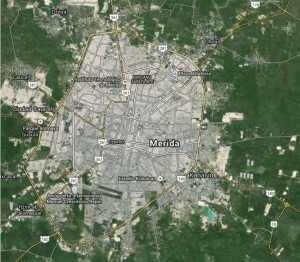 With this limited information because this is not a scientific article I can conclude that an increase in the maximum temperature in the city of Merida is detected for several months. I have not studied the causes of the increase in temperature but I can say that influences locally the lack of trees and excessive use of energy in general (more cars, more air conditioners, more smoke, etc.). I recommend you to take care of the high temperatures, it is possible that health problems occur in children, elderly and people who work outdoors. The authorities should consider changing class schedules in schools to prevent people from walking on the street between 13 and 16 hours; establish a program of reforestation of the city; develop a plan for monitoring the temperature and to generate signals of warning to the population; and implement nap times as was done before. What are the consequences on the physiology of organisms (animals and plants)? What is happening at the level of biological populations and biological communities? In agricultural areas on the outskirts of the city, how the crops are affected? We have much scientific work to do.